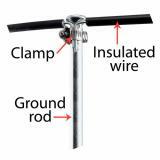 If you intend to use it underground, look to MaxiShock Double Insulated Cable or Double Insulated Wire (DCPIW34). 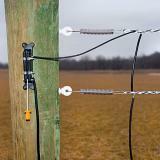 If you're installing permanent electric fences, use Double Insulated Wire (DCPIW34). It's extra-thick layer of galvanized zinc will protect the connection from rusting for years. 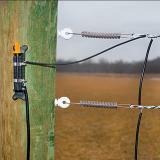 Unlike normal insulated fence wire, MaxiShock insulated cable does not require special connectors. 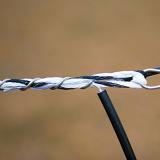 Cut the soft wire cable with a knife or heavy duty scissors. Strip off 3" of the insulation and wrap it 4 or more times around the wire by hand. It can be removed and reinstalled if needed. For making electrical connections to and from 12.5 gauge high-tensile (HT) wire. Make an electrical high-tensile wire connection with this high-tensile tap. It's HV cable. What more is there to know? 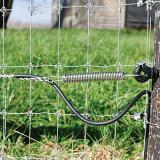 Worked perfectly to connect an AC charger in my barn to the electric fence around my garden 200+ ft away. 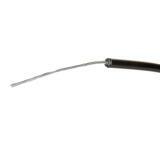 I bought the 500 ft. coil and found it to be easy to handle and rugged. 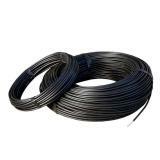 I bought 50' of this to have around for replacement wires and such. It is a nice rugged cable that is working well for me so far! This wire works really well with rope link connectors. I love the ease of adding the exposed wire in with the endurosoft rope when connecting 2 sections of the fence with the rope links.